It’s party season, and what party is complete without a soundtrack? 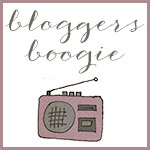 The Bloggers Boogie is back from now until the end of January to celebrate the fabulousness that is summer holidays! Blog up to five songs. Any theme, or no theme. One video or five. Come link up, from 9am AEDST Saturdays until 5pm AEDST Sundays. Pop around and enjoy the tunes! It’s that easy. Not a blogger? Feel free to post your songs on the Little White Dove Facebook page, or if you are a ThisIsMyJam or 8tracks user, link up with that profile! Heck, tweet me @thedovenest with your boogie! With Christmas upon us, I decided to go with a Christmas theme this week. You can also listen to my 2013 Christmas boogie here. Not to worry, I’ll just bombard you with Glee Christmas songs!!! I’m always good for some Glee!